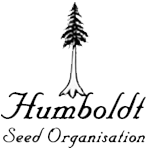 Humboldt Seed Organisation - Sapphire OG. Free US delivery. Sapphire OG is the result of an OG (Florida cut) x OG (Fc) x (OG (Fc)/Afghan) cross which displays a gorgeous colour palette as well as depth and complexity of aromas. Humboldt Seeds Organization state that this is an exclusive OG strain that bears little comparison with the majority OG-derived strains on the market. Sapphire OG is 85% indica and its vigorous vegetative growth means a fast switch to flowering during which this plant will double in size. This is a great plant for SCROG systems, its thin fan leaves encouraging light penetration for an even bud development so that even the interior ones have good density and resin content. 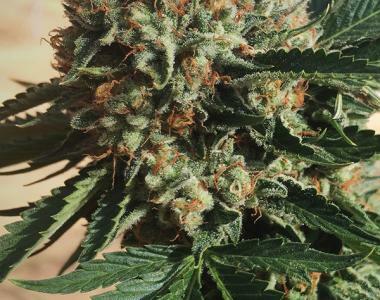 Indoors Sapphire OG finishes in 57 - 63 days and produces yields of 350 - 500 gr/m2; outdoors it will really take off and can attain a height in excess of 5 meters in the hands of skillful gardeners and given good conditions. Here each plant has a potential yield of between 1 and 4 kilos of dried buds from northern hemisphere harvests at the end of September or early October. Support is strongly recommended for the exceptional weight of buds in the final 4 - 6 weeks. Aromas of petrol, pine and chocolate predominate with secondary notes of citrus with floral undertones. The levels of THC produced by Sapphire OG falls in the range 18% - 24%. The effect is strong; cerebral to begin followed by a powerful body effect. Excellent for relaxing at the day's end and recommended therapeutically as an appetite stimulant and for the relief of pain.